Q: The US Acting Assistant Secretary of State Susan Thornton said yesterday that the new sanctions that the US plans to take on the DPRK may include measures on Chinese entities and financial institutions, and the US would offer customs assistance to China to help control any "illicit trade" with the DPRK. What is your response? A: I have noted relevant reports. As to how Ms. Thornton arrived at relevant conclusions and what evidence she has, you need to ask the US side for proof. In principle, China always opposes unilateral sanctions outside the framework of the UN Security Council, especially the "long-arm jurisdiction" imposed on Chinese entities and individuals by other countries in accordance with their domestic laws. This position has been repeated multiple times. I must say that China has been comprehensively and accurately implementing the Security Council resolutions and fulfilling its international obligations. If any Chinese companies and individuals are found to have violated the Security Council resolutions, we will investigate and deal with them in accordance with our laws and regulations. What the US has done will not help solve the problem or improve mutual trust and cooperation between China and the US on the non-proliferation issue. Q: Foreign Media reported that the Foreign Ministry of Panama announced on July 25 that the Embassy of Panama in China has been opened as prescribed in the agreement between the two countries on establishing diplomatic ties. So, when the Embassy of China in Panama will be opened? A: According to the agreement between the two sides, the trade office of China in Panama has formally become China's Embassy in Panama on July 13 and has begun performing its duties. Q: First, Botswana has confirmed that Dalai Lama will be visiting next month. What is China's comment on this? Second, the Pentagon has said that it has picked up signs that the DPRK is preparing for another missile test. I am wondering if China has any comment. Third, US Ambassador to the UN Nikki Haley said today that there has been progress in talks with China on imposing new UN sanctions on the DPRK. Do you have any further information to add to that? A: Let me take your question on the Korean Peninsula first. We have noted relevant reports. 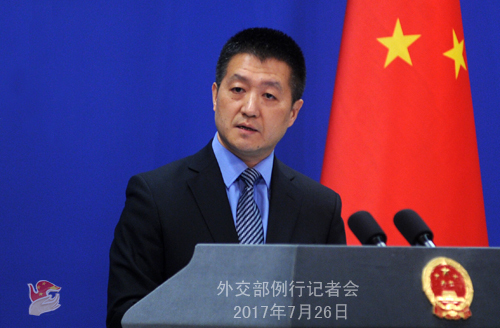 China remains committed to realizing denuclearization and maintaining peace and stability of the Korean Peninsula, and politically resolving the Korean Peninsula nuclear issue through dialogue and consultation. The UN Security Council has explicit stipulations on the DPRK using ballistic missile technology to conduct launching activities. For us, we oppose all violations of the UN Security Council resolutions. Given the complex and delicate situation on the Korean Peninsula, China firmly opposes any words and deeds that escalate tension and provoke rivalry. We hope all sides could see the larger picture of preserving peace and stability on the Peninsula, remain restrained, and work constructively to alleviate the situation, instead of the contrary. As for what Ambassador Hayley said, we are in touch with other Security Council members on deliberating the DPRK's missile launching activities, including the US and Russia. China always believes that any Security Council moves should help ensure denuclearization, peace, and stability of the Korean Peninsula. It is very important for the Security Council to remain united and speak in one voice on the Korean Peninsula issue. Considering the complex and delicate situation on the Korean Peninsula, all sides need to maintain pressure, and also work together to ease the tense situation on the Peninsula as soon as possible, creating a beneficial environment and atmosphere for resuming contacts and talks. We stand ready to work with relevant Security Council members to reset the Korean Peninsula issue back on the right track of peaceful settlement through dialogues. On your first question, we have noted relevant reports. 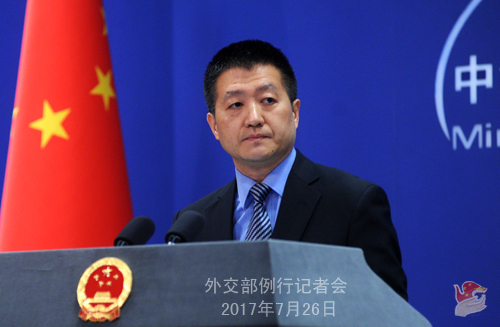 China has made its position clear on the 14th Dalai Lama's planned visit to the relevant country. I must stress that Xizang-related issues concern China's sovereignty and territory integrity. We demand that the relevant country shall earnestly respect China's core interests and make the correct political decision on this matter. China will not interfere in other countries' internal affairs, but will not accept another country doing anything that harms China's core interests. Q: According to the data from the Central Bank of Pakistan released last week, China was on top among other countries with 1.186 billion USD foreign direct investment in fiscal year 2016-2017 in Pakistan. Would you like to comment on this because this investment is quite important for the economic development of Pakistan? A: China attaches great importance to its all-weather strategic cooperative partnership with Pakistan and stays committed to increasing its trade and investment cooperation with Pakistan. In recent years, China's direct investment in Pakistan, which has been increasing at a fast pace thanks to the concerted efforts of the two sides, has driven up bilateral practical cooperation and Pakistan's economic and social development. China is pleased about that. The Chinese government will continue encouraging competent Chinese enterprises to invest and open up business in Pakistan and forge mutually beneficial cooperation. As the China-Pakistan Economic Corridor moves forward, China's investment to Pakistan will grow bigger. Q: Foreign Minister Wang Yi said earlier this week that the only solution for the China-India standoff in Donglang is for the Indian troops to back out honestly. What will be China's response if India doesn't stand down? It is reported that there are 3,000 troops on the Chinese side and on the Indian side each. Can you confirm this figure? Has any progress been made in talks on this front? 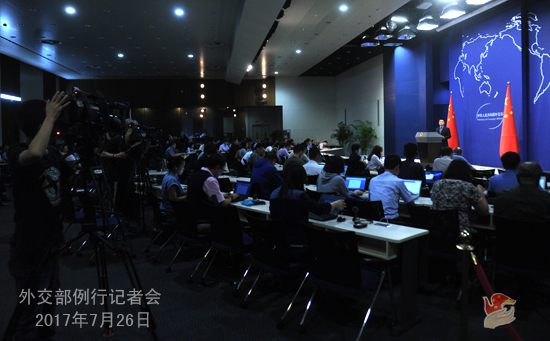 A: Foreign Minister Wang Yi's authoritative statement is clear enough and needs no further interpretation. As for the military alignment in the region, I would refer you to the Defense Ministry. As for any dialogues between the two sides, we have made it clear that the root cause of this incident is the illegal trespassing of the Indian border troops into China's territory. To resolve this issue, the Indian border troops must withdraw without further ado, as Foreign Minister Wang Yi said. That would be the precondition and basis for any meaningful dialogue.